A home pregnancy test is the most common test strip for diagnosis. Pregnant women have progressively increasing levels of the biomarker human chorionic gonadotropin (hCG), which is easily traceable in urine. A thin, colorful strip of antibodies will appear when hCG is present. However, there is much more hCG in urine than there is of cancer biomarkers in blood. Detecting minute concentrations is the biggest challenge of test strips that have been produced to detect numerous things from cancer to heart problems to infectious diseases. The actual stripe on the paper just is not sufficiently sensitive enough to change color for a human eye to easily see it at concentrations that make a life-changing difference. According to new research led by Xiaohu Xia, an assistant professor of chemistry at Michigan Technological University some nanoparticle with bling could transform that. Also, it would not significantly impact the cost of existing test strips. The research details have been published recently in Nano Letters. Gold nanoparticles have been used extensively for years for in vitro diagnostics to make medical care and treatment decisions faster and easier for patients and physicians. The novelty of Xia's research is incorporating a dual function to the nanoparticle by covering each tiny sphere in a thin skin of platinum. This would make it easier for the naked eye to view changes on the test strip. It also boosts the accuracy and offers quantifiable results for very low concentrations of major biomarkers, which are measured in picograms per milliliter. In Xia’s research, they concentrated on prostate-specific antigen (PSA), searching for signals of mere trillionths of a gram in one drop of blood. "We require the detection to be very sensitive," Xia says, explaining that platinum is a very promising catalyst and small quantity goes a long way to increase the chemical reaction that causes a test strip stripe to appear. 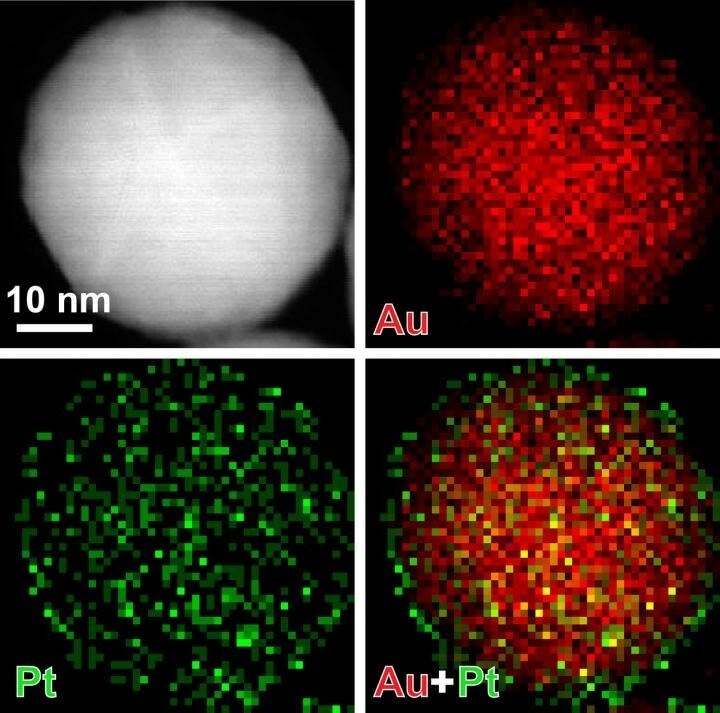 "Gold nanoparticles are a distinct red color and as long as the platinum is ultrathin, the red of the gold nanoparticles will show through." Xia’s team took that enhancement a step forward: they created a low-sensitivity mode (color from gold nanoparticle cores) and a high-sensitivity mode (color from platinum skins through catalysis) to detect PSA. The high-sensitivity mode significantly enhances test strip visibility; the low-sensitivity mode is equal to test strips available commercially. Xia estimates the thin platinum skin will not considerably increase the cost of existing gold nanoparticle test strips and the design is compatible with identifying other kinds of cancer biomarkers. A key component in the test strip is the antibodies, which are unique to each cancer biomarker, and are commercially available. We can easily replace the antibody, so this is a general detection platform. The following step Xia says is confirming the application for other cancer biomarkers and even testing with applications for infectious diseases. All it took was a bit of fancy covering. Incorporating some new platinum layer to conventional gold nanoparticles will help push better test strip technology from labs into clinics and homes.